Prize launch with Rachel Cusk and Will Self. Rachel Cusk is the author of eight novels: Saving Agnes, which won the Whitbread First Novel Award, The Temporary, The Country Life, which won a Somerset Maugham Award, The Lucky Ones, which was shortlisted for the Whitbread Novel Award, In the Fold and Arlington Park, which was shortlisted for the Orange Prize, The Bradshaw Variations and Outline. Her non-fiction books are A Life’s Work, The Last Supper and Aftermath. In 2003 she was chosen as one of Granta’s Best of Young Novelists. She is Reader of Creative Writing at Kingston University. 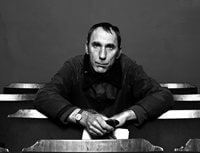 Will Self is the author of six short-story collections, a book of novellas, nine novels, and six collections of journalism. His work has won the Bollinger Everyman Wodehouse Prize for Comic Fiction and the Aga Khan Prize for Fiction. His penultimate novel, Umbrella, was shortlisted for the Man Booker Prize. His most recent novel is Shark, which weaves together multiple narratives across several decades of the twentieth century. He is Professor of Contemporary Thought at Brunel University.